My rule for Connor and deciding on when/where we ride based on outside conditions is that if we could possibly face it in an event, we will ride in it at home. So, it's not likely that we'll ride in super cold or super icy conditions, so we don't ride out in those, but 70 degrees and 45 mph winds like we had today? No way would I ever scratch an event for that. It's my job to teach him that he has to listen to me no matter if I ask him to leg yield down Main Street, give me a controlled canter in a thunderstorm, or jump with a dog barking next to the arena. With that in mind, we headed for the outdoor. All of the ponies were crazy today with the weather. We had the following against us today: construction materials wrapped in plastic blowing next to the arena, neighbor practicing for the opening weekend of deer shotgun season next weekend, Connor's Andalusian girlfriend running and bucking like a maniac right next to the arena. From the beginning, I asked him for a lot of the lateral stuff and a ton of transitions. For the most part, I had his attention. I wasn't expecting perfection today, or anywhere near the quality of work we got on Thursday; all I wanted for today was for both of us to survive, and for him to prove that he will listen to me. I only lost him to a spook twice, and though they were bigger than normal, they were still more or less in place. Despite the spooks, he was lazy, and I had my eye on the tiny crossrail set up in the middle of the outdoor. I'm not one to jump without a trainer normally, but I wanted to jump so badly, he seemed quiet, and I didn't want to wear out the lateral work that's contributed to our big breakthroughs lately, so I pointed him toward it. Even with all that going on, he trotted it and barely noticed it. I ended up trotting and cantering it both at various points through the lesson, and that unusual quietness was pretty much the rule the entire time. None of his usual wiggling, no looking at the fence, no gigantic jumps that tossed me out of the tack - just popping over it like a mature pony and going on. 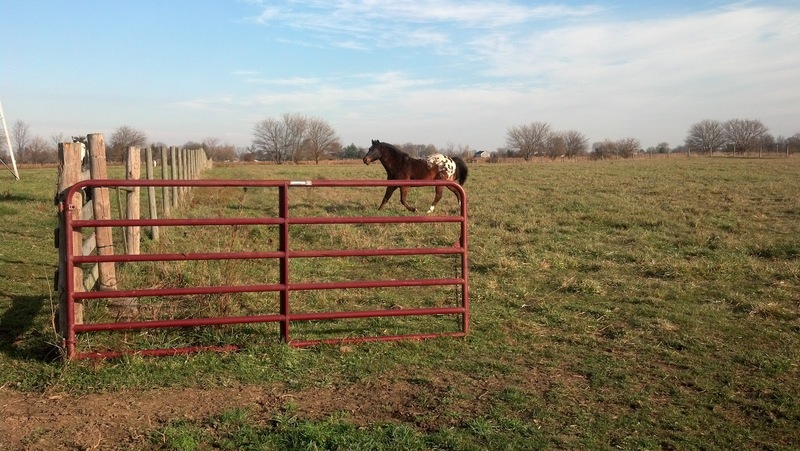 This is the type of thing we need to do in order for both of us to get comfortable with fences. He needs to learn that he can handle anything I point him at, and I need to let go of the residual...not fear, but apprehension, I feel before fences. I enjoy it so much, but some tiny part of me is still nervous and micromanaging the ride all the way up to the fence. 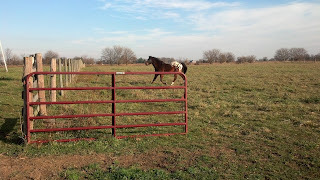 We both need to learn that jumping is no big deal, and both of us need to develop a partnership and get used to agreeing on spots before the fence. Repetition will be our friend. That was the most promising part of the day. At the canter, our first spot was a chip, the second was beautiful, the third one was long (but not big, still very efficient and bored), the third was a chip, and the fourth and final attempt at the canter was perfect. He even offered a perfect simple lead change on the last one, the only one in which he landed on the wrong lead. I quit on that one, and gave him lots of praise and treats afterward; it felt so good, and just flowed. To have that sort of jump school with the weather being the way it was is outstanding. Tomorrow, though, it's back to the reality of the indoor, with rain and highs in the 40's. Such is life. Now I stick within my comfort zone. Wish we boarded at the same barn so I could have a riding buddy...all the women at my barn think I am crazy to still be riding outside! But I strongly feel the same way - the weather is not always our friend at a show. Looking forward to seeing you and Connor at shows next year!